The Houston Oilers faced the Los Angeles Chargers in their first home game of the inaugural American Football League season on September 18, 1960. 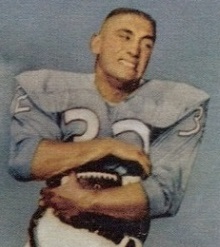 Coached by Lou Rymkus, the Oilers had made one of the new league’s biggest splashes when they signed HB Billy Cannon, the Heisman Trophy winner out of LSU, away from the NFL’s Rams. They also had an established veteran in 33-year-old QB George Blanda (pictured at right), formerly of the Chicago Bears, who had been lured out of a year’s retirement and also doubled as a reliable placekicker. Nagged by injuries, Cannon had yet to show the expected form as a pro, but less-heralded first-year FB Dave Smith gained 104 yards on the ground in the first-week win over the Raiders. The Chargers promised to be a significant test. A highly-regarded team under the direction of Head Coach Sid Gillman, formerly of the Rams, they featured QB Jack Kemp throwing to a capable group of receivers. The line, anchored by rookie OT Ron Mix, was a good one and the defense was especially effective in the secondary. LA had won all four of its preseason games and then came from behind the previous week to defeat the Dallas Texans in the regular season opener. There were 20,156 fans in attendance at Jeppessen Stadium on a steamy 90-degree day. On their second possession, the Chargers put together the first scoring drive as Jack Kemp completed five of six passes for 47 yards. The last was to flanker Royce Womble in the end zone for a 25-yard touchdown and Ben Agajanian kicked the extra point. On LA’s next series, following a punt by the Oilers, CB Mark Johnston intercepted a long pass by Kemp and returned it 33 yards to the Los Angeles 47. After an incompletion on first down, Blanda pitched out to Dave Smith, who ran 47 yards for a TD. Blanda added the game-tying point after. The Oilers again got into scoring position thanks to a 51-yard punt return by Billy Cannon to the LA 27. A screen pass to FB Charley Tolar reached the three and the series ended when Blanda kept the ball himself for the final yard and a touchdown. Blanda converted and the home team was in front by 14-7. As the game headed into the second quarter, the Chargers were forced to turn the ball over on downs at their 36 after FB Howie Ferguson was twice stopped short of gaining the necessary yard to keep the series going. Blanda passed to a leaping end John Carson for a first down at the two and it was the quarterback scoring once again from a yard out and adding the point after to extend the lead to 21-7. The Chargers came back with a 62-yard drive as Kemp (pictured at left) connected on seven of eight throws, the last to end Ralph Anderson in the end zone. Agajanian’s kick narrowed the Houston margin to 21-14, and that remained the score at halftime. The Oilers started the third quarter by advancing 71 yards in seven plays that included Blanda throwing to Carson for a 36-yard gain. For the third time, Blanda finished the series off with a one-yard touchdown on a quarterback sneak and added the extra point. HB Ron Waller fumbled the ensuing kickoff and Houston recovered at the Los Angeles 19. The home team wasn’t able to reach the end zone, but Blanda kicked a 13-yard field goal and Houston was ahead by 31-14. Once again the Chargers turned the ball over on the kickoff, with HB Paul Lowe the culprit this time, and the Oilers again had possession at the LA 23. A clipping penalty moved them back to the 41, but Cannon, breaking three tackles, ran 39 yards to the two yard line. Tolar powered over for a one-yard TD, Blanda converted, and Houston, with 17 third quarter points, had a huge lead of 38-14. The reeling Chargers finally put together a sustained drive, going 83 yards as Kemp passed to TE Howard Clark for a 50-yard gain and to Womble for a 19-yard touchdown, with Agajanian kicking the PAT. But the Oilers were able to run the clock down in the fourth quarter with backups Jacky Lee and Charlie Milstead in relief of Blanda. Late in the game, Los Angeles put together a five-play, 89-yard scoring possession with the big play a pass from Kemp to FB Charlie Flowers that covered 55 yards for a touchdown. But with less than two minutes left to play, the verdict was long decided. Houston won by a final score of 38-28. The Oilers had the edge in total yards (377 to 357), with 284 of Houston’s total coming on the ground, while the teams were even in first downs with 22 apiece. The third quarter proved critical as the Oilers scored 17 points and Los Angeles ran only seven plays to take an insurmountable lead. The Chargers turned the ball over four times, to two by Houston, although the Oilers were penalized ten times, at a cost of 88 yards, to five flags thrown on LA. George Blanda didn’t have a high-percentage passing day, completing just 6 of 17 throws for 101 yards with no touchdowns or interceptions, but he was effective when he connected. He also scored three TDs on quarterback sneaks among his 20 yards on five carries. 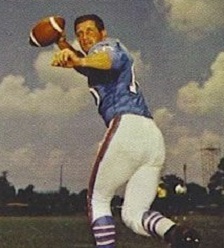 Dave Smith (pictured below) topped the Houston rushers with 77 yards on 14 attempts that included a touchdown. Billy Cannon added 68 yards on 8 carries and returned a kickoff for 32 yards and two punts for 57. 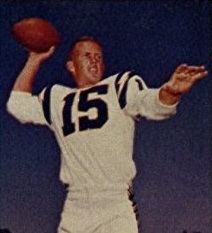 John Carson led the receivers with three catches for 54 yards. For the Chargers, Jack Kemp completed 27 of 44 passes for 337 yards and four touchdowns (all of which remained season highs) while giving up one interception. Ralph Anderson had 8 catches for 50 yards and a TD and Howard Clark gained 94 yards on his four receptions. Royce Womble contributed five catches for 65 yards and two TDs. It was a lackluster day for Los Angeles running the ball and Howie Ferguson led the club with 20 yards on 7 attempts. The Oilers lost their next game but remained consistently strong throughout the season, topping the Eastern Division with a 10-4 record. The Chargers lost two of their next three contests but finished with eight wins in nine games (including the rematch with Houston) to also compile a 10-4 tally and top the Western Division (A key component of the second-half surge was the insertion of HB Paul Lowe into the starting lineup, adding potency to the running game). The two teams met for the AFL Championship, won by the Oilers. The Chargers departed LA for San Diego the following season. George Blanda passed for 2413 yards and 24 touchdowns and ranked second in the AFL in field goals with 15 and scoring with 115 points. The three rushing TDs against the Chargers were truly an anomaly, as he had compiled a total of five in his years with the Bears and, after tallying one more during the 1960 season, never scored another in the remainder of his long career that ended in 1975.